What has your fear prevented you from doing? Has it stopped you from getting close to someone because you're afraid your heart will get broken? Has it caused you to miss out on incredible and fun opportunities? Has it stopped you from living your life? Fear is a crazy thing because if we internalize it long enough, we can rationalize our fears and use them as an excuse to not do something. I've long said that Jess and I are one in the same in a lot of ways — we're both perfectionists who have their lives planned out. We both love structure and order and relationships don't have that, as much as we'd like to believe we do. Jess has learned over the years, though, that the best things in life are the ones you can't plan out. She didn't plan to find her boyfriend cheating on her and have to move into a loft with three guys she met on Craigslist. She didn't plan to fall in love with one of those guys. She didn't plan to lose her job, teach in a variety of settings, and eventually become the principal of a school. But she did. Just like Nick never planned to move on from Caroline, to find something he's good at, to finish a novel, or to be a successful adult. But he did all of those things. Everyone in "Five Stars for Beezus" had to learn to be brave. Life is about taking risks and being brave when things are scary. And boy, did everyone take a leap of faith in this episode. While this felt like it could be a series finale, I hope it wasn't. Because I have a feeling that these acts of bravery are just getting started. So below, I'm going to break down the review by talking about the ways in which each character decided to be brave in the episode. I talked last week about how Jess' default response to a lot of things is to run away. She ran away to Portland and in this episode, is prepared to do that again — except for a longer period of time. 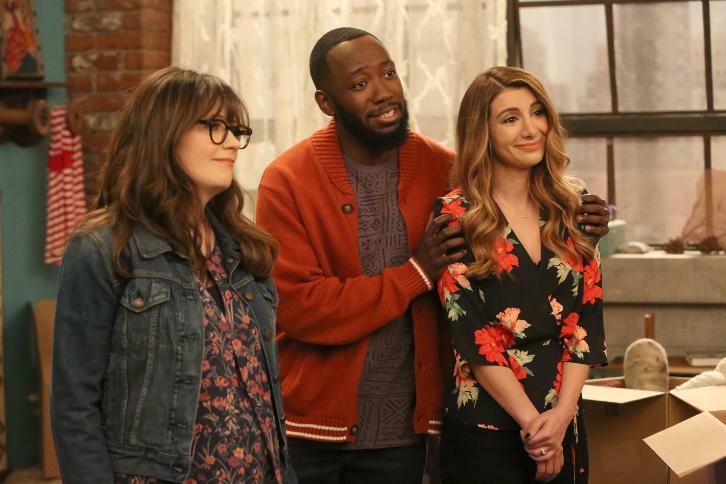 During a book reading, just as Jess is ready to confront him about her feelings, Nick tells the audience that Julius Pepperwood and Jessica Night will never get together because they're based on real people who are just fundamentally different. It's then that Jess makes the decision to run. Rather than stay and live in the same loft as the man she is in love with, Jess opts out and packs up her stuff to head to Portland for the summer. Both Schmidt and Cece think this is a bad idea, and are desperate for Nick and Jess to just talk about their feelings rather than avoid them. Because even though Jess is a strong woman, she's primarily driven by her emotions. When she gets emotionally invested in someone, it hurts her. And to be rejected by Nick again is something she just can't physically will herself to deal with. It's easier to run — away from Nick and from the potential of getting hurt — than be brave, especially when your emotions are on the line. But everyone in the episode (from Schmidt and Cece to Winston and Aly) encourage Jess to tell Nick how she feels about him, even if it all goes wrong. By the end of "Five Stars for Beezus," Jess still believes that running away is the best option. That is, until she hears one song on the radio: "(I've Had) The Time of My Life." She smiles in the backseat of the moving van, and I think she finally realizes that she has something incredibly special with Nick. She can't run away from that, even if she places physical distance between them. There will always be something that connects her to him and if she doesn't tell him how she feels, Jess will regret it. She jumps out of the van and decides to be brave. It's a beautiful moment of character progression for a woman whose default is to protect herself and her emotions at all costs. It shows that she realizes the risk and chooses love anyway. Schmidt: Why on earth do you think that you are so okay with this Reagan break-up? Nick: Reagan and I are in different places in our life. It's fine. Why hasn't Jess called me back? Schmidt: You guys are pretty good friends, right? But if you remember correctly, you didn't even want Jess to move into the loft. Nick, why do you think that is? ... Why don't you think you wanted Jess to move into the loft? Nick: I don't know. Because I was... I was afraid. Schmidt: Nick, you have been in love with this girl from the moment you opened the door and you first laid eyes on her. I have never seen you look at anyone else like that in my entire life. ... For once in your life, don't be afraid. Nick has always been the kind of person who is hesitant. If you remember in "Injured," he tells Jess as much — that he's not the guy who runs into the ocean with everyone else. He's the guy on the beach, holding the wallets. But slowly, over the years, Nick has learned to accept change. He's learned to grow and to be vulnerable with people. Reagan was a huge step for Nick to learn how to communicate how he feels and what he wants in a relationship. He's no longer the guy who can't finish a zombie novel or who is afraid to run into the ocean. Nick is not afraid of change anymore. And that's why he runs back to the loft to tell Jess how he really feels about her. You guys, I can't even express how perfect the scene between Schmidt and Cece at the episode's end was. Backing up momentarily, however, Jess answers Cece's phone and discovers that her best friend is pregnant. Winston and Aly then discover this news by answering Cece's phone on accident, and soon, the only person who doesn't know that she's pregnant is Cece. I think New Girl did a fantastic job back in the day with discussing Cece's fears about not being able to have children. She didn't want them when she thought she had plenty of time, and to hear Cece tell Schmidt that she didn't think it was possible to have kids was heartbreaking and yet uplifting. When Schmidt is tasked with delivering the news, he does so by filling the room with flowers. And this is where Hannah Simone truly shines, because Cece just starts to break down crying. Even though we haven't spent a lot of time recently on Cece and Schmidt's position on having kids, it feels believable that Cece didn't think it was possible to have them, given her age and issues a few years ago. It feels so satisfying for these two to have found one another and gone through the journey they did. I'll say one thing about New Girl that I've said from the beginning — they're a show that's in it for the long haul. Through Schmidt's season of villainy to Cece finding love with other people, and then them finally being together, the Schmidt/Cece journey was absolutely beautiful. I am incredibly grateful that the writers took their time developing this pairing because it's proof that playing the long game when it comes to television romance might just be the very best thing. I absolutely loved everything about the Schmidt/Cece story in "Five Stars for Beezus" and am grateful to this show for writing such an organic-feeling romance. After being told by Jess that he has permission to run away from his problems, Winston decides to do a terrifying thing: call his dad. Aly had discovered his father's phone number and gives him the option to contact him. Winston initially declines in the episode and spends most of his time vehemently against any form of connection. But when he sees what Jess is about to do and how she's prepared to run away from the things that scare her, he realizes he would be hypocritical to tell her to stay if he wasn't facing his fears too. He gets Van's voicemail, but leaves a message anyway and is open to the possibility of eventually meeting his father. After hanging up the phone, Winston tells Jess that now it's her turn to be brave. Though it takes until she gets into the moving truck to do so, Jess eventually decides to be brave. And that leads us to the final section about bravery: Nick and Jess. Nick runs back to the loft, only to find that he's too late. Jess has already packed up all of her stuff and moved out. But at that same time, Jess has run back to the loft to tell Nick how she feels about him. It's an adorable moment because it's a callback to something Nick reminisced about earlier — the moment Jess moved into the loft and he first saw her. It's incredibly important because that was the moment Nick realized he loved Jess for the first time, and this is the moment he realized he never stopped loving her. A hilarious series of near-misses leads the two in the opposite situation: Jess runs up to meet Nick and he runs down to meet her. They holler to one another to stay put, but of course they don't listen. Instead, they find their way to one another in the elevator. Nick is frustrated because a man is taking his sweet time unloading a cart of packages, and Nick tells the man: "I gotta tell my best friend that I'm in love with her!" At that very moment, the man walks out and reveals Jess standing behind him. I can't explain the kind of perfection with which Zooey Deschanel and Jake Johnson play Jess and Nick. All I know is that the way Nick looks at Jess is strong enough to melt a polar ice cap. I have no doubt in my head that either stopped loving one another. Their connection has always been incredible. From the beginning, there has been a spark and when that spark was explored, the two weren't ready for romance to blossom permanently. They were both still stubborn in what they wanted — Nick didn't want to grow up and Jess didn't want to compromise what she believed was the vision of her perfect future. But now Nick has grown up and Jess has realized that planning isn't always the answer. So when Nick steps into that elevator, it feels exactly like a moment of clarity (and parallelism, because we all remember how "Virgins" had that elevator scene, right?) for both characters. And as the doors shut, they don't say anything — but they're smiling. It's this relief that after chasing after one another for years and after physically chasing after one another in this episode, they're finally in the same spot. IT WORKS ON BOTH LEVELS: LITERALLY AND METAPHORICALLY. When the doors shut, I assumed the episode would end. But as Lorde's "Green Light" swells, the elevator opens and Nick and Jess are kissing. Fear has been abandoned and everyone in "Five Stars for Beezus" has learned that being brave takes a lot of effort and work. But in the end, it's still worth it. Because bravery is always harder but more worthwhile than fear. If you don't do the things you want to, you may lose your opportunity. Kids, as Alexander Hamilton once reminded us all, don't throw away your shot. Be brave. See where it takes you. I absolutely loved this episode. Liz Meriwether did an incredible job writing it, and it seemed to wrap up the storylines in a satisfying way. "LET'S HEAR IT FOR BOOKS!" I can't get over the fact that the publisher's name is "Merle Streep." The scene with Nick, Schmidt, Jess, and Cece in the kitchen was comedy gold. "He's always dumb. He's the dumbest boy in school!" The Nick/Schmidt conversation at the publisher's is so beautiful that I don't even know where to start. But I think my favorite line is: "Don't be afraid." What a lovely sentiment coming from Schmidt, who has grown so much over the years. "Are you going to Portland?" "Nooooo. Portland is hella white." "What, Winston? I'm using social media!" "Now it's your turn. Be brave." Fred Willard guest-starred which means that my two favorite comedies (Community and New Girl) continue to share cast members. "It's a caramel miracle." True story, I began sobbing when this scene happened. Schmidt and Cece have come so far, and both Max Greenfield and Hannah Simone's acting was absolutely beautiful — totally understated and true to their characters. I have no doubt Schmidt and Cece will be excellent parents. Also, how adorable were all of those flowers?! "I gotta tell my best friend that I'm in love with her!" A+++++++ use of Lorde's "Green Light" in that final Nick/Jess scene. BRILLIANT. Well, folks, I hope I'll see you back here next year! Even though this felt very much like a series finale, there's still hope that the show will be renewed and we'll get to see more antics (a pregnant Cece would be hilarious, Winston still needs to reunite with his dad, and we all want another round of Nick/Jess right?). I adored the Nick/Schmidt conversation as well, not just because of what he was saying, but the way he was smiling all the way through it. Schmidt does have a tendency to be grumpy and overbearing when Nick is being - well, Nick - but in that moment he was so gentle and so fond and it was such a beautiful moment of friendship for them. I also loved how he comforted and was such a good friend to Jess. I just love friendship okay. And the bit when Cece came back in and Jess, Aly and Winston were all beaming at her made me laugh out loud. So perfect.